Capt. Steve Ritchie with an F-4D (#463) on ramp at Udorn Royal Thai Air Base after his fifth victory. USAF photo. Born in Reidsville, NC on 25 June, 1942, Richard Steven (Steve) Ritchie entered the U.S. Air Force Academy in 1960. Upon graduation on 3 June 1964, he entered pilot training at Laredo AFB, TX. Initially assigned to flight test operations at Elgin AFB, FL, flying the F-4 Pantom II at Homestead AFB, FL. By then a captain, in 1968 Ritchie flew the first “Fast FAC” mission in the F-4 forward air controller program out of DaNang Air Base, South Vietnam. In 1969 he completed the F-4 Fighter Weapons School at Nellis AFB, NV and became one of the youngest instructors in the history of the school. Ritchie volunteers for a second combat tour in January 1972 and was assigned to the 555th Tactical Fighter Squadron (“Triple Nickel”) of the 432nd Tactical Fighter/Reconnaissance Wing in Thailand. Flying with Capt. 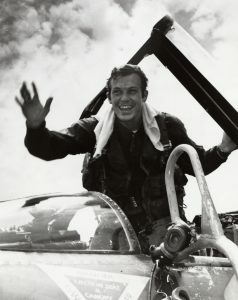 Charles D. DeBellevue as his “backseater,” he downed a MiG-21 40 miles northwest of Hanoi on 10 May and was credited with his second MiG-21 on 31 May. A low-altitude dogfight 30 miles west of Hanoi on 8 July gave him two more MiG-21s, and on 28 August he destroyed a fifth MiG-21 to become the Air Force’s only ace pilot of the Vietnam War and America’s only MiG-21 ace. Ritchie received the 1972 Mackay Trophy for the most significant Air Force mission of the year and the Colonel James Jabara Award from the Air Force Academy and in 1973 he was presented the VFW Armed Forces Award for outstanding Air Force professionalism and leadership. Leaving active duty in April 1974, Ritchie remained in the Air Force Reserves and became active in his own business as a speaker and consultant, advocating the free-market economy in all spheres of American life. He was promoted to brigadier general in the Reserves in April 1994.